In April 2017, Marthe Bijman provided proposal preparation services on the Capital Project Engineering Services proposal of Tetra Tech Canada (Mining), in Saskatoon, Saskatchewan, for a large potash producer that cannot be named under a confidentiality agreement [“the client”]. The Engineering services required amounted to a maximum work volume of 30,000 man hours per year in capital engineering projects for an established operation. The proposal was successfully shortlisted and Tetra Tech [“the company”] had the opportunity to present to the client’s Capital Project Engineering selection panel. 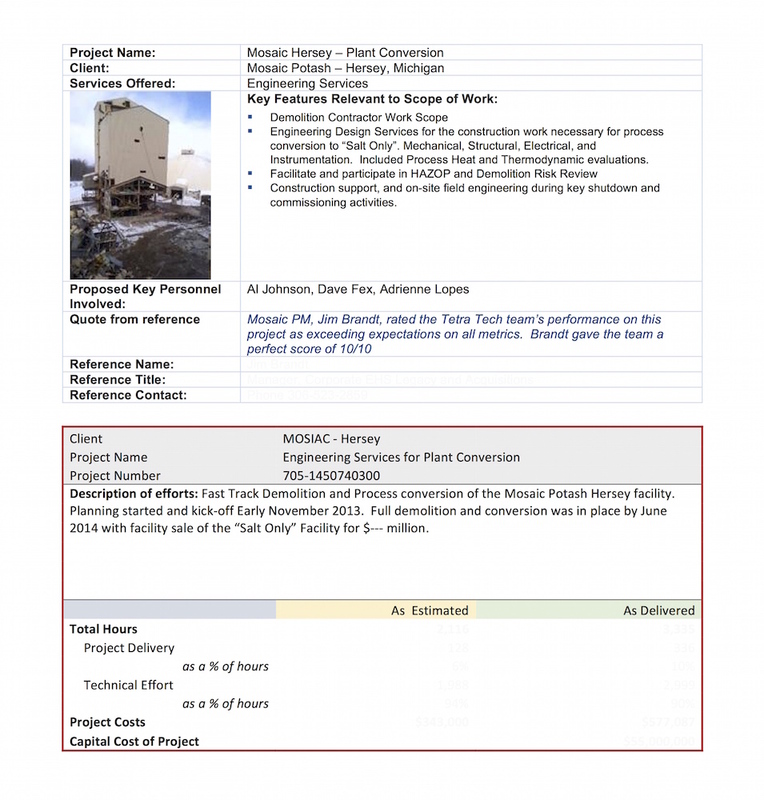 The short but intense process was a case study in how to quickly produce a compliant and responsive proposal, which was achievable because the Tetra Tech Saskatoon team knows proposal management best practice and worked accordingly. To put the market in perspective, the potash deposits of the Western Canadian Sedimentary Basin, specifically in Saskatchewan, are the largest in the world, and Potash Corporation of Saskatchewan (PotashCorp) is the largest producer, with five mines in Saskatchewan and one in New Brunswick, Canada. Photo from: Analyst calls recent PotashCorp cutbacks surprising, says market improving, 650 CKOM, November 24, 2016. Photo of mineral sylvite, a potassium salt better known as potash: FILE PHOTO/650 CKOM. One of the storage facilities at Potash Corp.’s Rocanville mine, one of Saskatchewan’s lowest-cost potash mines. (Image courtesy of Potash Corp.) Photo from: Potash Corp. and Agrium merge, create $36bn fertilizer giant, by Cecilia Jamasmie, in Mining.com, Sep. 12, 2016. Photo from: PotashCorp earnings rise in Q1 report, by 650 CKOM, April 27, 2017. Photo of PotashCorp operation by FILE PHOTO/650 CKOM. The proposal manager, Mike Desilets, led the effort to ensure that the work was done by the book. The proposal manager knew from experience what the proposal would cost to produce and secured his human resources in advance, ensuring there were no “nasty surprises” either way during the process. The proposal manager and his team knew the individuals who they were talking to on the client side and adjusted their approach accordingly. The proposal was wide in scope and highly specific. (See the index for the technical part, below.) Though it was issued as an RFP, an extensive, detailed SOQ was required. The line-by-line analysis of the RFP showed that the quantity of information was not unusual for a senior producer such as this client. However, for internal reasons, the Tetra Tech team only had eight work days in which to produce it. The contents had to be rewritten to have the same writing style as well as consistent win themes throughout the document. Index, indicating compliance, of the technical part of the proposal. 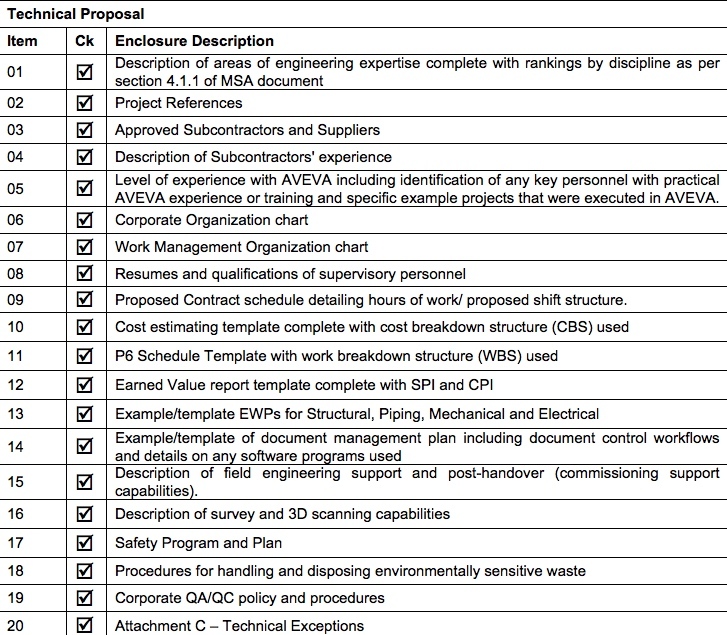 The proposal document consisted of technical and proposal sections, as well as attachments. The technical section was ultimately 300 pages long, the commercial section was an additional 55 pages. Sourcing and editing photos and graphics. The proposal had to be produced according to the client’s requirements. Some use was made of Tetra Tech’s company templates, but the RFP was too specific to avoid extensive customization. Source and secure the involvement of staff who had experience with the specific software suite used by the client, AVEVA, intended for engineering and ERP. The team had to know both the software and the specific operation. Some of the team members had previously worked at the operation and knew exactly what was required. Ensure that all the Lead Engineers were registered senior-level Professional Engineers with APEGS (Association of Professional Engineers and Geoscientists of Saskatchewan), with extensive experience, e.g. about twenty years, in the field of potash mining and processing. Meet the client’s special requirements for staff with specific skills in dust collection, fire protection and high voltage electrical distribution, for all of which the company could provide personnel. Design the proposal to be both compliant, meeting every requirement of contents and format of the client, and responsive, showing that the team can solve the client’s problems and respond to their hot buttons. These included the software suite, specialized potash processing technologies, and engineers that could deal with the size and location of the operation. Affordability of the services was another hot button but, in the market downturn (see the newspaper article linked to the image, above) taken as a necessity for inclusion. Meet the client’s requirement for proof of industry experience with similar projects on a similar scale. A viable track record, usually of the preceding five years, is almost impossible to fake since the client can – and probably will – cross-reference project contractors, scopes of work and dates, against publicly available information, as well as the CVs of individual engineers. You either have it, or you don’t. This is particularly true when it comes to “soft factors” such as Aboriginal/First Nations engagement in Canada and Corporate Social Responsibility/Investment programs in other jurisdictions. When those have to be quantified, with dates, names and dollar values, that’s when the rubber hits the road. Collate information so that every skills discipline that the client required was matched to quantified project examples and contactable client references in the document. The Senior Mechanical Engineer of the Tetra Tech team did an excellent job of providing the financial information and business case of each project, to match the project description. In this instance, the numbers in the business case for each project spoke larger than pictures or words. This made “cutting and pasting” practically impossible. Throughout the document, the client’s specifications meant that simple repetition of existing proposal text was impossible, and everything had to be customized. Go the extra mile. Even though the client did not emphasize it over the other information, they did ask for details on First Nations & Métis (FNM) initiatives. The Tetra Tech team, through experience, knew that this might become a crucial issue further down the road, and therefore took the trouble to provide appropriate information on their aboriginal Joint Ventures and Limited Partnerships. The relevant and, moreover, authentic information was provided by Tetra Tech’s Senior Advisor of First Peoples’ Community/Business Relations, Gordon W. Mohs, Sxwoxwiyam, El:ólìye, Pop’qo’les. This kind of track record is impossible to fake and proves solid credentials. The proposal was successfully shortlisted and Tetra Tech had the opportunity to present to the client’s Capital Project Engineering selection panel. Ultimately, this is all that counts for the proposal writer and producer – that the company moves one step further in the proposal process towards securing a sale.  Rating of Red Pennant’s performance on this proposal, by Mike Desilets, General Manager – Prairie Region, Tetra Tech Canada. What was the best aspect of working with Marthe Bijman?